In a breakout performance that has Hollywood buzzing, Hong Chau turns “Downsizing” into something much larger. In the midst of a hedonistic all-night rave, the hard-partying next-door neighbor in “Downsizing” shares his sage wisdom on his new, reduced-footprint lifestyle, boasting that those who have been shrunken in size and have unlimited wealth are living a dream. “They’re just small,” he says. His quip is a perfect encapsulation of the biting social and political commentary that drives Alexander Payne’s latest, opening Friday nationwide. The seriousness is kept at arm’s length, however, as the film strikes a darkly comedic tone throughout and offsets any battle of ideologies with a genuine vision and sense of humanity. Meanwhile, an unorthodox procedure has been introduced by Norwegian scientists, making headlines across the globe with its expressed goal of saving the planet from runaway overpopulation. It’s called “downsizing” and is the process of shrinking volunteers to around five inches tall … permanently. The upside is an instant improvement in lifestyle – one dollar has a thousand times more value in downsized communities than in the big world, and planned developments provide for a luxurious new life. After suffering through never-ending financial stagnation and a bit of soul-searching, Paul and Audrey make the decision to “get small.” The glorious plans fall apart after tiny shrunken Paul discovers that his wife got cold feet and backed out. Sensibly, the film is marketed as a vehicle for Damon – he is, after all, a major movie star. However, despite being all but absent from the trailers – and nowhere in the print ads I’ve seen – little-known actress Hong Chau is really the focal point of this film, the axis upon which the heart of the story rotates. Every now and then, a breakout performance infatuates Hollywood, seemingly out of nowhere. 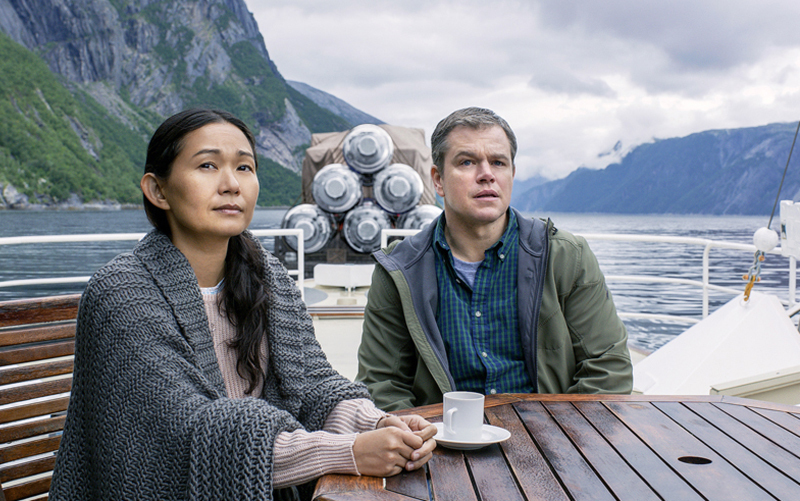 As a Vietnamese political dissident and exile, the 38-year-old Chau simply steals the film, commanding attention in every one of her scenes, and in the process, transforming “Downsizing” into something that emphasizes hope and purpose, rather than class and division. And there’s plenty for her to command. The story turns on a dime once her character – an amputee cleaning woman – arrives. The glossy, picture-perfect (and let’s be fair, predominantly white) paradise is peeled away to show how the other half lives. In a role she earned by way of an open casting call, Chau has received heaps of praise, as well as a Golden Globe nomination for best supporting actress. It’s one of this year’s most-discussed roles, but it isn’t without controversy. 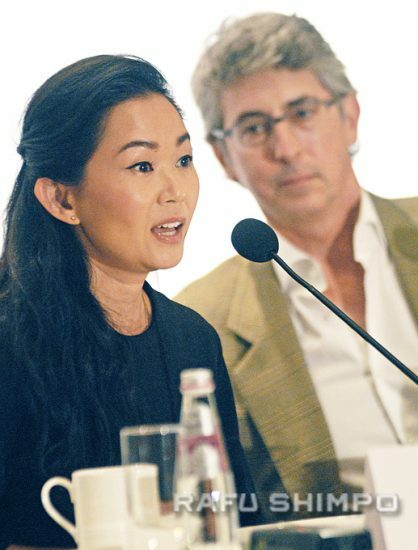 At a press junket for the movie held in Beverly Hills earlier this month, Chau found herself fielding questions about whether her character, Ngoc Lan Tran, is just another entry in a long and sorry history of shameful Hollywood stereotypes. “It’s tricky thing,” she said, handling her comments with the skill of a seasoned actor who’s accustomed to the grilling of a press conference. “Downsizing” is just her second feature film role. Chau said she understands the sensitivity felt by many about her character, who works in menial labor in spite of a disability and speaks with a molasses-thick Vietnamese accent. With much attention being paid recently to depictions of minorities in mass media, and the “white-washing” of Asian characters out of stories (Scarlett Johannson in “Ghost in the Shell” or Emma Stone in “Aloha” are examples), the New Orleans-raised actress said she’s well aware of current attitudes. “I think there’s a difference between characters with an accent who have two lines in something and my character, where she is driving a good portion of the story,” Chau said during a roundtable, noting how reactions between fans and journalists have been very different. “I’m not sure why people are so flabbergasted to hear a person with an accent,” she further explained. “When British or Australian actors do an American accent, they’re lauded for their acting skill. “At the end of the day, this character is mine,” she insisted. “My character is not in the background,” Chau said. “I’m not there to prop up the white character. “I can’t really work from a place of resentment,” she added later. “Downsizing” opens nationwide Friday. Rated R, 2hours, 15 minutes.